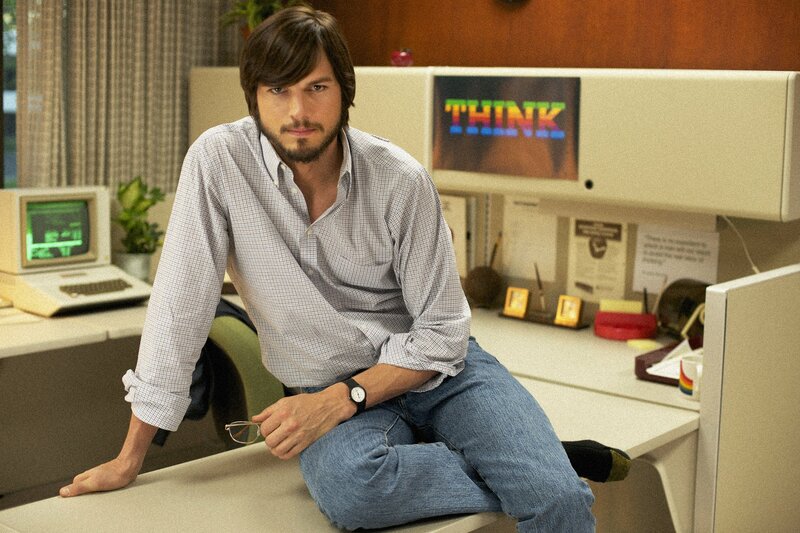 The bio-pic, “Jobs” starring a convincing Ashton Kutcher as Steve Jobs, is scheduled for an April 19 national release, following its world premiere Jan. 25 at the 2013 Sundance Film Festival. The selection of “Jobs” to close the festival was a big honor for a longshot project that was produced on a shoestring $8 million budget, using a lot of rookie talent and a somewhat mercurial director, Joshua Michael Stern (“Swing Vote”). While the film elicited a very warm response from the premiere audience, reviews were tepid. A crew member revealed the film was still being edited as they had boarded the plane to attend the premiere; in fact, it was likely more editing would follow – before its theatrical release. 1. The film-makers did not have the rights to “Steve Jobs”, the definitive Walter Isaacson book authorized by the Apple founder, and published in 2011 a few weeks after Jobs’ death from pancreatic cancer at age 56. Another film company bought those rights, and the estimable Aaron Sorkin was hired to write the script. So the “Jobs” crew had to use a lot of material in the public domain to construct their film. 2. The film-makers did not have cooperation from Apple itself, co-founder Steve Wozniak, or many of the other Apple employees, business associates or friends depicted in the film. I don’t think they even received permission to use current Apple Inc. logos, properties or products. 3. A principal source of information for the film was apparently Marilyn Jobs, Steve’s stepmother – who barely knew him, and vice versa. She was the No. 1 person thanked in the credit roll. Now almost 80, she still lives in the same Los Altos house where Jobs and Wozniak formed Apple Computer in 1976. Jobs was adopted by Paul and Clara Jobs in 1955; Clara died in 1986 (the year Steve left Apple and founded NeXT). Paul Jobs married Marilyn a couple of years before he died in 1993. Marilyn told visitors to the home in 2011 that she had not seen or heard from Steve in years. 4. Time was of the essence; the production company decided they needed to rush to get their project done before the highly touted Sorkin version of the film could crush their effort. Filming began even before casting was completed, locations selected, and production design finished. Marilyn Jobs’ permission to film at her home wasn’t even granted until well into production. Shooting began in June 2011, and ended within a month. 5. Ashton Kutcher wasn’t the only actor considered for the role of Jobs. “Others were considered,” said a source. “But they were either busy with other projects, or not interested. I think, though, that Ashton was always Josh’s first choice. I know Ashton really wanted the role.” Kutcher agreed, “I wanted it, but I was terrified by it; I knew I was throwing myself into a gauntlet of massive amounts of criticism since Steve’s persona is still so fresh in people’s minds.” Somewhat surprisingly, Kutcher’s performance was cited in most early reviews as the strongest component of the film. 6. Matt Whiteley was another surprise as the screenwriter. He’d never written a script before. He said his first draft was “over 325 pages.” The final cut of the film probably encompasses less than half of that. In fairness to Whiteley, the public won’t ever see his original vision on screen. What they will see is a choppy, gap-ridden plot that is the film’s biggest weakness. (Sorkin, meanwhile, was said to be constructing a plot around three decisive real-time incidents in Jobs’ life, shown in flash back from a point nearer Job’s death.) Whiteley’s script, as shot by Stern, starts in 2001, flashes back to 1971, then progresses back to 1998 or thereabouts. 7. Steve Wozniak, after the film premiered, said the script missed the mark by about 180 degrees. He said his interest was in developing great products and giving them away for free. Jobs was interested principally, in Wozniak’s opinion, in selling the selling the things they made and making lots of money. The film seems to depict Woz more of just a talented geek, and Jobs as the visionary who was able to see how Woz’s inventions could enrich people’s lives. For the record, Isaacson’s book suggests Woz was the technical guru, while Jobs was more focused on design, packaging and marketing. For awhile, it was a partnership that meshed. 8. Ashton Kutcher said he lost a significant amount of weight to play Jobs. Besides his immersion in Jobs’ character, gestures, voice, manner of speech and writings, he also went on Jobs’ eccentric “fruitarian” – fruit only – diet. “It almost killed me,” he said. “Two days before shooting began I wound up in the hospital with shooting pains in my gut. My pancreas levels were off the charts – which was very scary, considering everything that happened” to Jobs. Kutcher didn’t say whether he also experienced the other known side effects of the diet: strong body odor, loose bowels and chronic farting. 9. While the director was a stickler for some detail, such as the cars Jobs drove – a ratty Ford Pinto, his mom’s Volvo wagon, a 1961 Ford Ranchero, his first (of many) Mercedes-Benz SL sports cars and a Porsche 928 – other details missed the mark. Look up how Steve Jobs looked in 2001, when he introduced the iPod. He was still the picture of health – not the rather gaunt, gray-haired, gray-bearded cancer victim he degenerated into later. 10. Where was “Jobs” filmed? Generally speaking, not where you think it was. Except for the notable exception of Marilyn Jobs’ home, locations used were not in Silicon Valley – flyover footage of the Apple campus in Cupertino and some second unit B-roll in India, notwithstanding. “Jobs” was almost entirely filmed in the Los Angeles area, including sites at UCLA and Loyola Marymount universities, Pasadena’s Civic Auditorium, Woodland Hills, Chatsworth, Simi Valley, Van Nuys, Valencia and Santa Clarita.